budrichard wrote: It's always been my experience that satellite restaurants never match the original location in quality and ambiance. Hopefully a new location can be found to build on the original. Really like the dedication of the owner and the food! There already is a "new" location - on Fulton Market. The ambience is not a match to North Ave but I thought the food there was every bit as good. Another sotry. No new location yet. 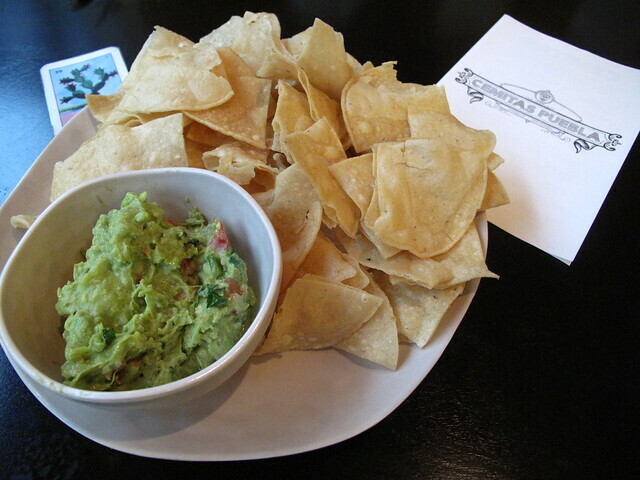 agree that the Fulton Market location is just as good. one thing to note, the menu there is smaller - they still have all the cemitas, but i'm pretty sure some of the peripheral stuff is not there. The news really bummed me out and I hope that they are able to find another location near the original spot. I'd hate for a truly great neighborhood place to become just another West Loop option. Strangely I just ate a cemitas at the West Loop location yesterday and it was easily the best one I have eaten at either location and may even cause me to reevaluate my opinion that Cemitas Puebla is overrated. Maybe this has to do with the closure of the Humboldt Park location? botd wrote: Strangely I just ate a cemitas at the West Loop location yesterday and it was easily the best one I have eaten at either location and may even cause me to reevaluate my opinion that Cemitas Puebla is overrated. Maybe this has to do with the closure of the Humboldt Park location? 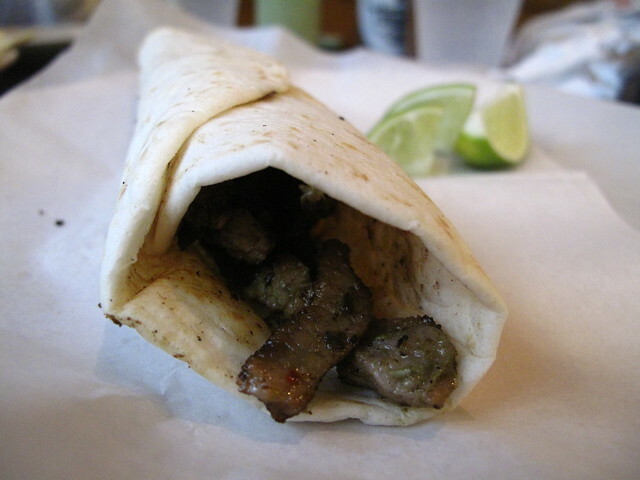 There is also alchemy to the quesadilla con chicharron at the new location, worth exploring. Note that the "cemita de queso," (double shredded cheese, double avocado, chipotle sauce) is still made here as another vegetarian option, just not listed on the menu. I have not yet noticed handfuls of papalo on Fulton. Seasonal? Part of the plan, I hope? Papalo is seasonal, not sure when it starts. Also, I think you have to ask for it. Yes it's seasonal, but they had a tendancy to omit it even when it was in the house (at least it happened to me a few times) so yes, ask for it. Tony told me a few months ago that papalo season runs from about the second week of June to the second week of October, so they should start having it available pretty soon I'd think. Update: I ate an Atomica for lunch today and asked Tony about papalo again. He said that normally it would be available by now, but that since the spring has had so many cold days it's not quite ready yet. He told me to check back in a week or two, and after today's sandwich, it might take me a week or two before I can eat again. So good though. I'll be back soon. 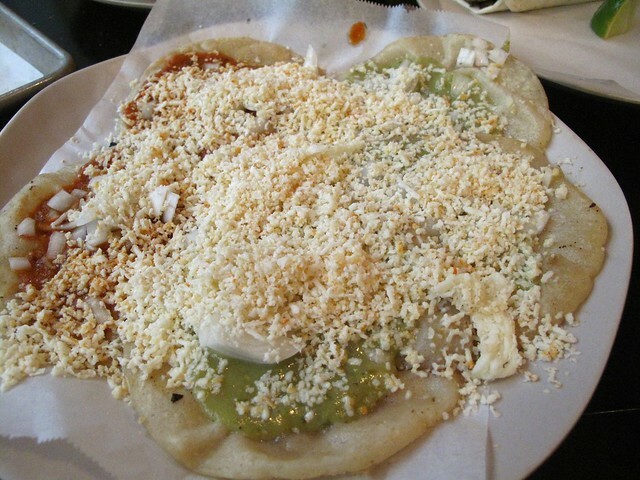 Cemita. Tasty. I'd like to see them use a better quality cheese and a little less of it, but all the parts were good and it's one of the better versions I've had in the states. Papalo option would have been nice, as would the option to put some chipotles on it, though it had a good deal of the sauce. Those are quibbles, though. Taco arabe. Very good. This would hold up in Puebla. I'd heard rumors but I guess it's offiical now . . .
First, they have secured a space in Humboldt Park, which requires significant renovation and won’t be ready until next summer. Until then, they will operate a temporary restaurant — think of it as a one-year pop-up — in Logan Square, across the street from the cocktail bar Scofflaw. They will take over a turn-key space at 3129 W. Armitage Ave., and with a functional kitchen and only minor renovations required, Anteliz believes he can be open as early as October. ronnie_suburban wrote: I'd heard rumors but I guess it's offiical now . . .
what great news. selfishly, i'm happy as i can easily walk to this new, temporary location. i was really worried that tony might be content with just the new fulton location. How much will I have to eat at this new location to convince Tony to keep it open permanently??? blipsman wrote: How much will I have to eat at this new location to convince Tony to keep it open permanently??? alot. when the opening day is announced, why don't we 'gang up' and go as an LTH group?? I'm so stoked that it's reopening even closer to me! 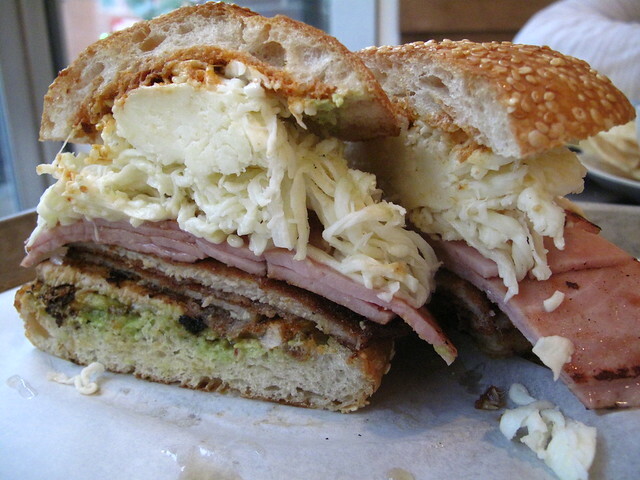 I can't wait for many 1-2 scofflaw-cemitas. Not to piss on the fireworks here, but I had my second abysmal visit to the Fulton shop. The bread was back to the chewy crust I remember loving on North Ave. (unlike my last nasty post upthread). But everything else was out of whack. I thought I was clever ordering an Atomica without the salt bomb ham. In hindsight I would have preferred the pink Polish stuff to the grey, unseasoned flaps of pork they're selling as carne enchilada these days. The milanesa had a weird thing going too– a few nicely crisp strips falling off the sides- have I bitched about the lopsided construction yet? But the stuff in the core of the sandwich had the breaded steak carpet effect, maybe from being hot held or steamed to death in the sandwich rendering it essentially the same flavorless grey product as its bedmate though upholstered in a sticky paste. No mid-summer papalo. Why so much cheese? Past its prime avocado (on one half of the sandwich). Oxidized salsa verde. I have noticed that the place is helmed primarily by art student-looking schlubs. Back in the day on North Ave. it seemed as though Tony or family was deftly constructing my once favorite sandwiches in town. Hopefully they will put the effort back in for us at the new place. We've been there twice (Fulton) from our office for lunch and, although the sandwiches have been decent, they aren't nearly as good as I remember from the few trips I'd made to North Ave. We also have Xoco and Cafecito in our rotation and honestly, Cemitas comes in third at this point. Jefe wrote: I have noticed that the place is helmed primarily by art student-looking schlubs. Mods - I don't ask for much... but if you could find someway/somehow to make this a banner quote, I would be deeply indebted. Trust me, takes one to know one. The Lunch Gods were on my side today and I dined at the "new" location on Armitage. As a point of reference, it's located in the back of what appears to be a new strip mall with no signage on the outside. As a result, it's very easy to miss the spot . I assume new signage is forthcoming. The new spot is bright and spacious. Open kitchen just behind the front counter. Plenty of seating. The usual self serve Coke dispenser off to the side. Nice bathrooms. Flat screen TVs. It's been a while since I was at the original location. I chose a Cemitas Al Pastor with a side of chips and salsa. All appeared to be freshly made and quite good. As a point of reference, my lunch was just after the 11am opening time. Twice during my lunch, a friendly staff person asked if everything was ok and offered to refill my drink. All in, a tasty lunch on a sunny day. Good thing I had a supply of Tic Tacs in the car as I had an appointment with a client afterward. I don't recall salsas (other than the chipotle cemita sauce) and sides being a particular strong suit on North Ave., and was pleased that the trimmings on today's cemita feast from Fulton were mighty fine. 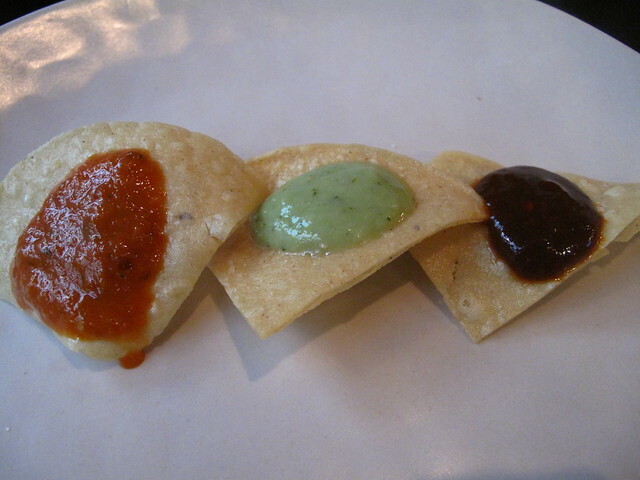 The green salsa was intensely sour with lime and tomatillo and balanced right on salt and cilantro; the red with dried chile and fresh tomato flavors. The jicama slaw, rich beans, and herbaceous dirty rice were better than they needed to be at $2 each, and generous portions. The cemitas and tacos were just fine - a very nice way to treat the average meats as always. 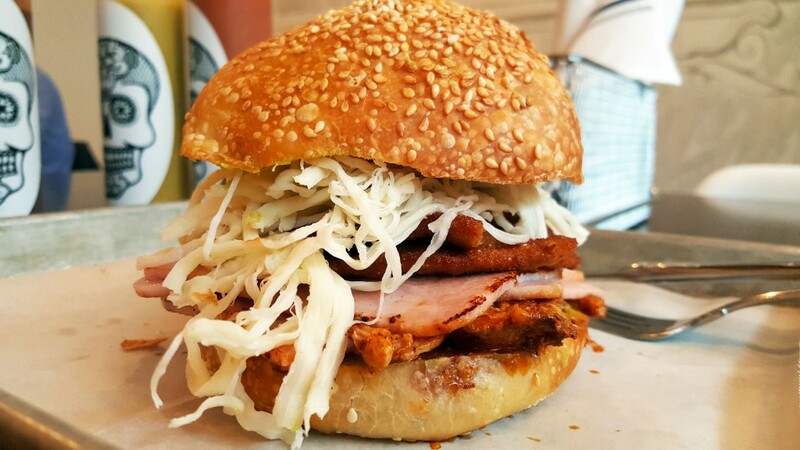 "Cemitas Pueblas has begun moving into the old Edwardos space. Fixtures from the previous occupant are being placed in the alley or you can just ask. Cool posters of garlic scapes or pigs if that's your thing (it is mine). The guy is super nice. Late August is the target date for opening. The building is still for sale but it won't affect them." The old Edwardo's space is on 57th street, where the ill-fated Packed dumpling place was. I haven't had a chance to stop by yet to check it out for myself and I haven't seen anything else online about this, so don't take this as first-hand reporting, but it sounds legit, and if true would be a wonderful development for Hyde Park (and my lunch plans), and probably a better fit for 57th street than Packed was. Wow, they will do gangbusters there. I lived in HP for 5 years and don't remember any Mexican at all beyond the dubious Maravilla's. Cemitas Puebla is opening next week in Hyde Park and is adding a breakfast menu, a first for the restaurant. Wow, hadn't heard they were gonna open in Hyde Park! And that's interesting they are gonna try a breakfast menu there. I wonder if it works there, if that'll be added to their other 2 locations? Hope they succeed in Hyde Park. I should visit their new location at Armitage and Kedzie sometime, since I hadn't visited there since they were near North and Central Park. The Hyde Park location was absolutely packed today at 12:30 (lots of students, but not only students), but the very busy kitchen kept things moving and there was lots of staff on hand bussing tables. My arabe cemita (I normally get the Milanesa, but am planning to eat Katsu Curry tonight) was excellent, better than the last sandwich I had at the Fulton market location. Great bun, no papalo (which to be fair they clearly mark as seasonal). The arabe meat in my sandwich was really nicely crisped up, while the meat in my wife's taco arabes was much softer and missing some char. She still said her tacos were good. Salsas probably the high point. The line was already dying down when we left around 1:20 so plan accordingly. One other thing; they had catering menus available (personal cemitas lunchboxes, platters of full or mini cemitas, etc), a great idea with all the university meetings going on in the neighborhood. On the way to work this morning, I stopped by to check out the breakfast menu. They had a variety of tacos and mini cemitas available. I went with the veggie taco (peppers, onions, potatoes, egg and cheese) which came with 3 different types of salsas. They also had conchas right out of the oven so I got a cinnamon one to go. I've never been too fond of these sweetbreads but perhaps that's because I've never had one right out of the oven. This one was light and airy with just the right amount of sweetness. I have high hopes for this place!